Anti-racist and queer politics have tentatively converged in the activist agendas, organizing strategies and political discourses of the radical left all over the world. Pejoratively dismissed as »identity politics«, the significance of this cross-pollination of theorizing and political solidarities has yet to be fully countenanced. Even less well understood, coalitions of anti-racist and queer activisms in western Europe have fashioned durable organizations and creative interventions to combat regnant anti-Muslim and anti-migrant racism within mainstream gay and lesbian culture and institutions, just as the latter consolidates and capitalizes on their uneven inclusions into national and international orders. The essays in this volume represent a small snapshot of writers working at this point of convergence between anti-racist and queer politics and scholarship from the context of Germany. 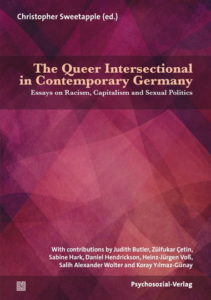 Translated for the first time into English, these four writers and texts provide a compelling introduction to what the introductory essay calls »a Berlin chapter of the Queer Intersectional«, that is, an international justice movement conducted in the key of academic analysis and political speech which takes inspiration from and seeks to synthesize the fruitful concoction of anti-racist, queer, feminist and anti-capitalist traditions, movements and theories.